Russian Army, 250,000 General Russky German Army, 400,000 General von Schubert General von Morgen General von Hindenberg Hinenberg continued his pursuit of Rennenkampf's army across the frontier into Russia. September 15, 1914 he occupied Suwalki, 20 miles beyond the Russian frontier. A week later, his army reached the west bank of the Niemen, the Russians being then entrenched on the opposite bank. On September 25, 1914 the Germans laid two pontoon bridges across the Niemen, but these were quickly blown to pieces. Hindenberg shelled the Russian position all the next day, but could not silence the Russian guns. On September 27, 1914, he built two more pontoon bridges, and these, too, were blown to bits. Thwarted at last, Hindenberg was forced to beat a retreat on September 28, 1914. The Russians now became the pursuers and as the Germans groped their way through the marshy region west of the Niemen and later through the forest of Augustowa, they were mercilessly raked with shell fire, but finally the main German army reached a point of safety across the German frontier. The Germans lost 60,000 men in this battle of Augustowa. Hindenberg thereupon transferred his command to General von Schubert and hastened south to direct the movements of the Austrian armies. Hindenburg enjoyed a long if undistinguished career in the Prussian Army, eventually retiring in 1911. He was recalled at the outbreak of World War I, and first came to national attention, at the age of 66, as the victor at Tannenberg in 1914. 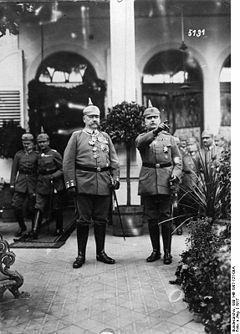 As Germany's Chief of the General Staff from 1916, he and his deputy, Erich Ludendorff, rose in the German public's esteem until Hindenburg came to eclipse the Kaiser himself. 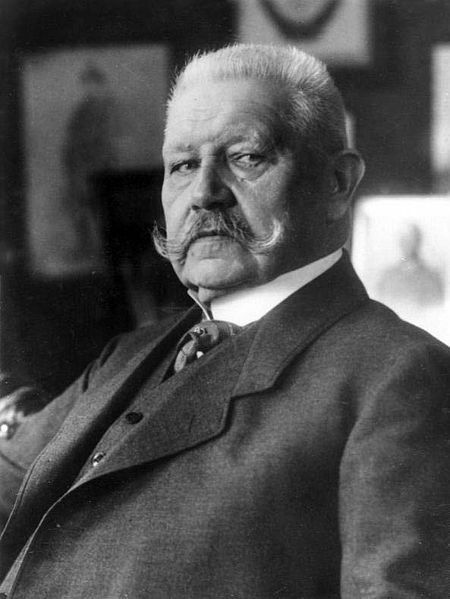 Hindenburg retired again in 1919, but returned to public life one more time in 1925 to be elected as the second President of Germany.